Discover the best multivitamin supplement for you. Multivitamins are one of the most important dietary supplements that you can buy. They are one of the few dietary supplements on the market that have credible scientific evidence showing their usefulness. Because of their broad range of general (yet essential) health benefits, my advice is to take multivitamins before even considering weight lifting supplements for performance. 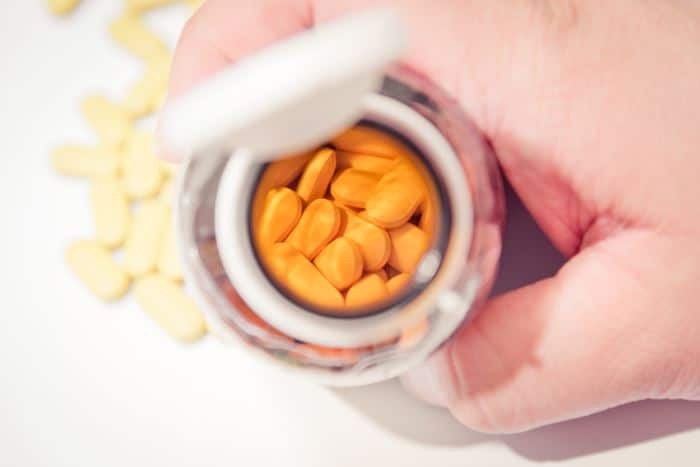 On this page, I’ll discuss the benefits of multivitamins, why you should take them, the two basic types of formulations (premium vs. standard), how to determine product safety and quality, and how to find the best multivitamin supplement for you. Plus, I’ll tell you which specific products I recommend. Note: To avoid any confusion, when discussing multivitamins, I am technically referring to multivitamins/multiminerals. This is simply for the sake of convenience. Are All Multivitamin Products the Same? This is not the kind of supplement that is meant to accelerate your progress or amp up your workouts; at least not directly. A multivitamin simply ensures your body receives all the micronutrients (i.e. vitamins and minerals) it may fail to get in your diet. Unless your multivitamin corrects a pre-existing vitamin or mineral deficiency, you can’t actually “feel” it working (except for maybe a slight energy boost). It’s not meant to produce acute effects. Rather, it is a supplement that promotes and sustains general health by providing your body with a sufficient amount of the micronutrients it needs carry out cellular functions. There are other potential benefits, too, but these are the big ones. …Well, it’s partly due to our increased micronutrient needs from intense and frequent weight lifting. Some of it may also be due to dietary restrictions from temporary, but strict diet plans (e.g. no carb-containing foods for contest preparation). We must also consider that it can be a challenge (not to mention, expensive), to buy, prepare and eat the optimal mix of nutritious foods when we’re already busy with training and trying meet our macronutrient goals (i.e. calories, protein, carbs, fats). And this is where a multivitamin supplement comes into play. You can think of it kind of like an insurance policy for your diet. That is, it will help you out if you make a mistake. Though, if you keep making mistakes, your premium costs (i.e. health risks) will rise. …It is a backup plan; a plan B in case you fail to reach your daily vitamin and mineral needs with foods only. But don’t let this become an excuse to slack on your diet. It doesn’t work that way. The Array of Micronutrients. Some multivitamins may contain all micronutrients known to mankind, while others may exclude some. Let’s take the exclusion of iron, for example. Such a formulation would obviously be superior if you’re trying to avoid iron overload. Iron overload, or the excess iron accumulation in the body, is a harmful condition that is an especially relevant concern for all non-anemic males who eat a lot of iron-rich foods (e.g. meat, dark-green leafy vegetables). The Amount of Each Micronutrient. Some multivitamins may have a larger quantity of, say, vitamin D. Yet others may have a much smaller amount. Let’s say you’re deficient in vitamin D. Then high-vitamin D formulation would of course be superior for you. It is actually a little known fact there’s essentially a worldwide vitamin D deficiency epidemic. Most people (yes, probably you too) have a moderate to severe vitamin D deficiency; to the extent that a dedicated vitamin D supplement is most practical for achieving a sufficient intake. Bioavailability. Bioavailability refers to the proportion of a given micronutrient in the multivitamin pill that can be absorbed into, and circulate within, your system. Bioavailability varies based on the quality of ingredients used in the product formulation. Higher quality ingredients have higher bioavailability. One option is to buy a premium multivitamin supplement from a trusted sports/fitness supplement brand. Why premium? Because that typically means that it has high quantities of ingredients. And why should it be from a trusted sports/fitness supplement brand? Because this means the formulation should be proportioned to best meet the needs of weight trainees (though in reality, this likely only gives you a slight edge). …This way, you can be fully confident that the multivitamin pills you’re taking are being sufficiently and efficiently dissolved, and then absorbed by your body. In other words, you can rest assured that your body’s actually getting the micronutrients it needs. Additionally, some premium multivitamins provide extra benefits, such as added non-vitamin/non-mineral ingredients for extra immune, joint, and digestive support. While these extras are by no means a requirement, it can be convenient for those who would otherwise be taking a separate supplement to get the benefits. Lastly, you can be quite certain that a trusted name brand multivitamin will be safe. Afterall, it is a trusted brand, right? However, I understand that you may be a skeptic (not necessarily a bad thing, by the way) and need hard evidence that your premium multivitamin contains what it claims and is safe. …For more on quality and safety, see below. 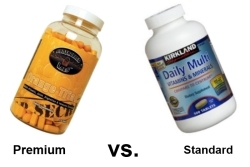 Another option is to buy standard multivitamins. Standard multivitamins are made with relatively low quantities of ingredients. The ingredients, themselves, are less than optimal in quality, in that they have a lower bioavailability. To make up for the low quantity and quality of ingredients, you can simply take double the recommended serving per day (e.g. if the label recommends one tablet per day, then take two instead; preferably one in the morning and the other in the evening). You can buy standard multivitamins from name brand companies (e.g. Centrum) or from generic brands. I strongly suggest buying the generic brands, so long as they are USP verified multivitamin products (for more on this, see below). This way, you save money by foregoing the extra cost associated with brand names, while still ensuring that your multivitamin meets minimum requirements for quality and safety. I’ve taken both premium and standard multivitamins before, and both will get the job done. Standard multivitamins are the most economical option. The cost per serving – even after doubling the recommended intake – ends up costing less than the average premium multivitamin. And while the premium multivitamin formulations do use more and better quality ingredients, you can essentially the same results out of standard multivitamins as long as you take enough of it. …So If you were planning on buying separate products for one of these functions, then this could be a way to eliminate the need for taking an extra pill. And it might even save you some cash, too. To decide if a premium or a standard formulation is the best multivitamin supplement for you, you must weigh the information I’ve given you and consider it in the context of your situation and needs. But don’t think too hard about it. In the grand scheme of things, it won’t make a huge difference either way. Personally, I’ve been known to dabble with premium multivitamins if I have a little extra money to spend. Otherwise, I go with the standard multivitamin. Whether you choose a premium or standard multivitamin, you should ensure that the product you plan on buying is safe and that its formula matches the label. In order to receive the GMP (Good Manufacturing Practices) certification, the manufacturer must follow the FDA’s GMP guidelines. In short, they must adhere to a strict production process, use correct labeling, eliminate contamination and be responsible for the correct identity, purity, strength, and composition of the product’s ingredients. For your reference, see this list of GMP certified supplement companies. You may not recognize many of those companies, as they are either major suppliers to, or parent companies of, the popular consumer brands. The USP (United States Pharmacopoeia) is a non-profit health organization. They’ve been around for a solid 150 years, setting quality, purity, identity, and strength standards for supplements, drugs and foods ingredients. Specifically, the product must contain the claimed ingredients and the stated amounts of each, be free of contaminants, remain fresh until its expiration date, have correct labeling and dissolve quickly enough for sufficient absorption. It is predominantly generic multivitamin manufacturers that go through the USP verification process. See all USP verified companies. You don’t see many of the more popular brand name multivitamins with this certification. I’m guessing this is because they’ve already built enough trust with their customer base. Independent testing labs are pretty self explanatory – They are the private, independent (at least for the most part) supplement industry watchdogs. They perform the same basic tasks as the USP and GMP certifications, though they are much less connected to governmental agencies or functions. The specific protocols vary between testing companies. What do they have in common, though, is that they all test the products themselves (as opposed to simply collecting data from the manufacturer). The top independent testing labs include ConsumerLab.com and the National Sanitation Foundation (NSF). It is worth noting, however, that the functions of the NSF overlap somewhat with governmental functions. For reference, see ConsumerLab.com certified brands and NSF certified brands. Now, I’ll provide you a some specific product recommendations for both premium and standard multivitamin supplements. All my picks have at least one of the above certifications. Hopefully this guide helped you better understand multivitamin and how to choose the best multivitamin supplement for you. …In other words, don’t forget to eat your fruits and veggies! (Yes, I have to remind myself to do this, too).